When you read the words “Maine home,” we bet there’s plenty that comes to mind: rolling hills, peaceful views, and classic New England style. Sustainability and efficiency, however, are probably not at the top of that list. In the past, prioritizing sustainability would dictate the overall design of a home, meaning styles like a classic Cape house would be out of the question. Today, however, it’s easier than ever to incorporate green features into traditional architecture… of course, having years of experience with both like we do doesn’t hurt either. 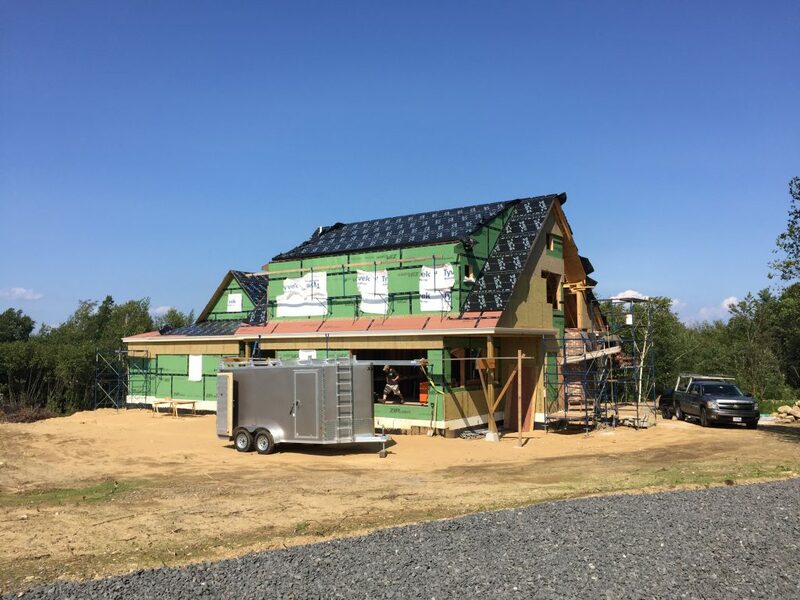 In this series of blog posts, we’ll be documenting the progress of a Maine home that features both classic design elements and a forward-thinking approach for both the current homeowner and the generations to come. We hope you enjoy following along! After lots of careful planning, it’s time to get to work. 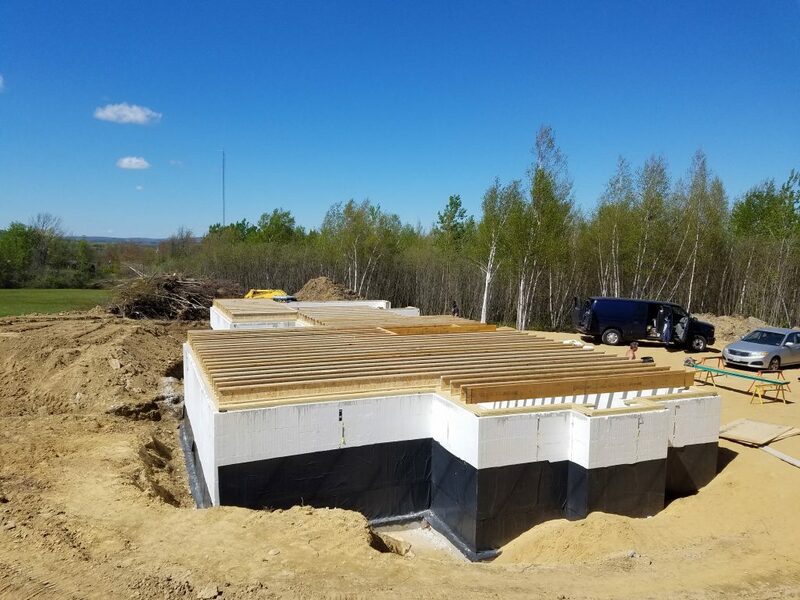 The foundations are ICFs, or insulated concrete forms. 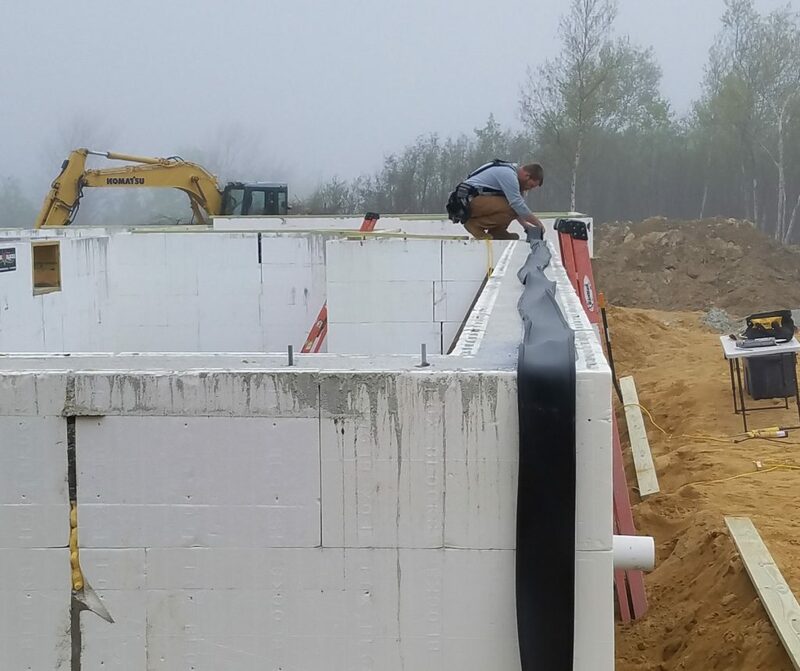 This product is acts as form work for the concrete walls, but includes a layer of rigid insulation on both the exterior and interior sides of the wall giving the basement space an R value of about 23. 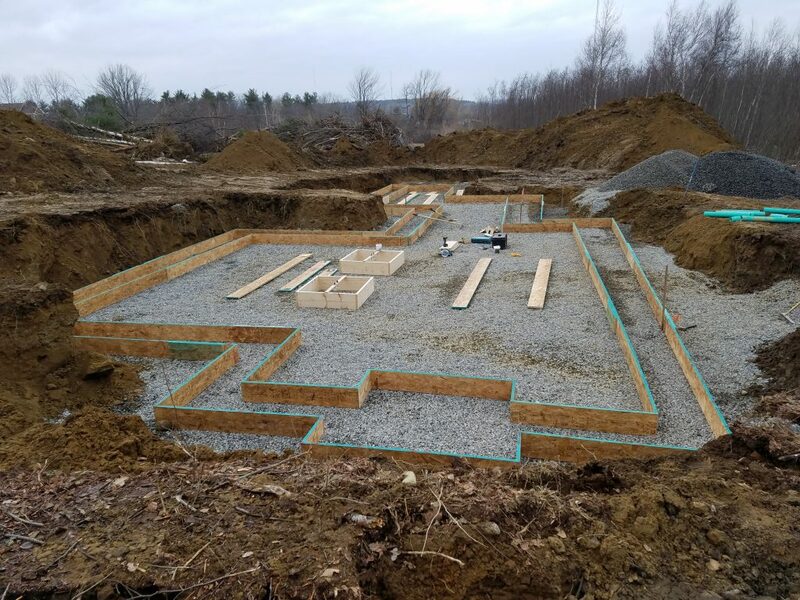 An additional 4” of rigid insulation below all concrete slabs means this home is completed insulated on all sides of the home. Another notable detail about this home is the layout, which is deliberately designed to be open. From a sustainability standpoint, this improves daylighting and should reduce the homeowner’s artificial lighting use throughout the day. But it also serves a practical purpose. The homeowner is older and currently still very much mobile, but wanted to be prepared for the future when she may require assistance moving around. An open floor plan, wide hallways, easy to enter rooms, and spaces where grab bars can be installed were all included in this design. You won’t find many “bells and whistles” of sustainable design in this home. Instead, we focused on smart construction that would lend to greater energy efficiency. The main focus is on creating a tight envelope, as minimizing air infiltration is a key component to reducing heating and cooling loads. This was done by using 2” of continuous exterior insulation along all vertical surfaces and filling the wall cavities with 2” open cell spray-foam followed by 3-1/2” Rockwool batt insulation and a continuous vapor barrier. Joints in the assembly, like at the wall plates, are sealed to mitigate air leakage through any minor imperfections found in the wood products. The type of glass used in windows and doors makes a significant impact on overall energy efficiency. 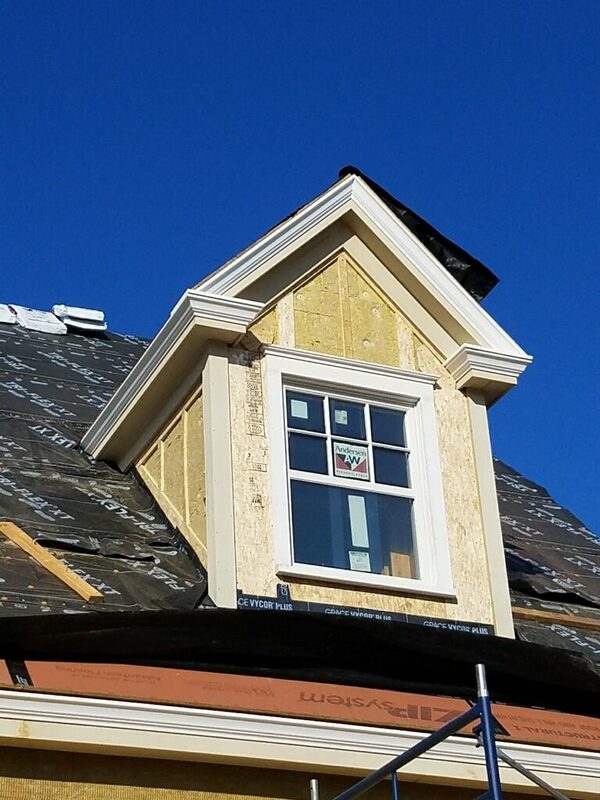 We used Andersen 400 Series High Performance Low-E4 windows throughout this home, which prevent heat from escaping while allowing plenty of light to pass through. Here, the basic structure is complete. 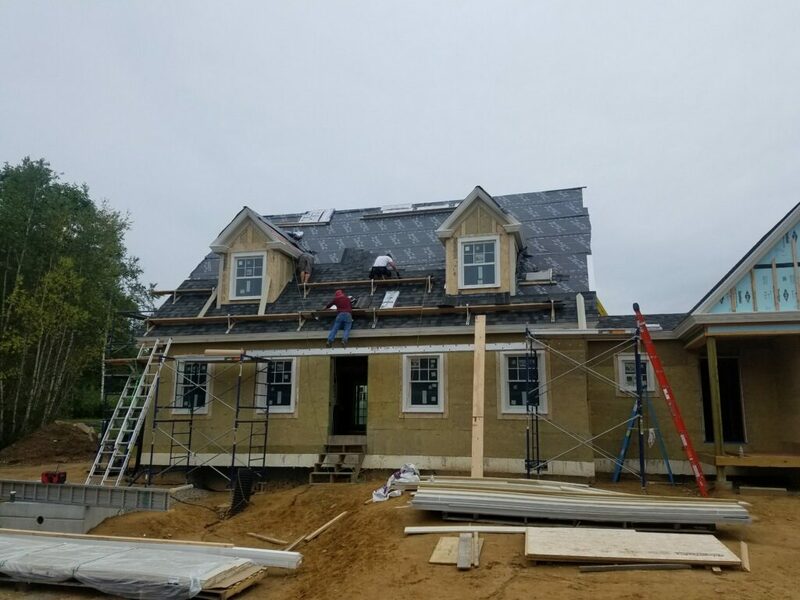 While there’s still plenty left to do, several of the key sustainable elements have been installed and it’s finally shaping up into a traditional Cape Cod style house. Up next, we’ll take a look inside. Stay tuned!